Are you thinking of giving your house a makeover? Should you do it yourself? 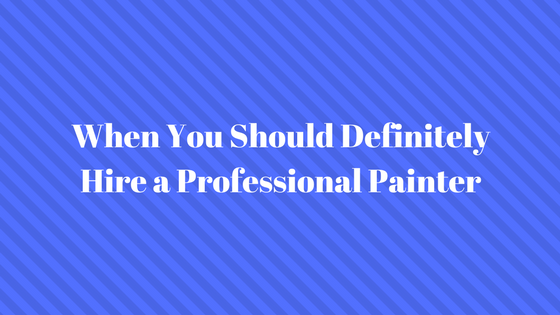 Should you hire a professional painter? Let me see if I can help. When should you hire a professional painting contractor? Do you have the right tools for the job? The applicators, the brushes, the rollers, the drop cloths, the tape, the scrapers, and all the things you will never use again. Is your equipment quality-made or did you get it from the dollar store? The last time you used that super cheap paint brush did you spend the next 30 minutes trying to dig out the loose bristles from your newly painted wall and the next 30 minutes trying to cover your fingerprints? I just described your current situation, didn’t I? Do you know what kind of paint to buy for your project? My friend painted his entire first floor with a paint that showed marks even if you didn’t touch it! Neither one of us can figure that out. Can you identify the repair work you might have to do? Do you recognize mildew? How about wood rot? Moisture damage? To get a quality look to your rooms or exterior, you need to prep the surface. Even if you don’t have substantial damage and repairs, do you really want to tape around the trim, the ceiling, the wall plates, the doorknobs, light fixtures and windows? Do you want to clean, scrape, sand, fill holes, caulk, remove light switches, outlet covers, smoke detectors, door bells, outside lights, flag holders, house numbers and the whole basket of things that a professional painter will do to get the surfaces in perfect shape before they paint? Are you ready to secure all of the areas of the house that are not supposed to have paint on them which will have paint on them unless you do what the pros do? Paint has a mind of its own and will go where it is not wanted. The pros know how to get a single room or a whole house paint-ready; and they can do it fast. Do you want your arms, legs and back to ache? Do you want to pick dried paint out of your hair? Do you really want to do all of the cleanup? Do you know your local codes for disposing of paint? Do you want to make the calls to find out? Do you really want to paint? Be honest! That is where a professional painter comes in – the firemen of all things paint-related. The unspoken heroes. Professional painters save you time and stress. They yield flawless, long-lasting, beautiful results. They make your neighbors envy you. They know how to detail a wall, a room or an entire home to perfection. They make even old houses look new. They advise you on the best paints, finishes and colors for the look you want. They know which colors add value, refresh and renew your home as well as which colors most appeal to buyers. They didn’t watch a DIY video before they came to your house. While those videos are helpful, a video is not going to even get you close to duplicating what years of painting know-how and experience can offer. Painting may look easy, but it’s not… not if you do it right and want to truly transform your space. A professionally-painted home adds value and increases its market value as well. Paint isn’t just paint anymore. Professional painters can match your home up with the best interior or exterior paint for your home’s construction-style and location. If you are like most homeowners that already have their own full-time job, taking on a paint project can take you weeks, even months to complete. Professional painters already have a full-time job and are motivated to make your home their priority. Don’t spend money twice by hiring a professional to fix the mistakes of a DIY-gone-wrong. You have the luxury of not having to worry about accidents when you work with an insured professional painter. Lastly, professional painters don’t just paint. They are pros at dry wall repairs and plastering, skim coating, staining, refinishing and varnishing woodwork, decorative painting that includes color washes, glazing and Venetian plaster. Your time is valuable and so is your home. Do what you do best while you let a professional paint contractor do what they do best – make your life easier while they make your home, inside and outside, more beautiful.